Lithiums are said to “last longer” compared to lead acids. But in real world environments, due to heat and generally primitively designed charging circuits of motorcycles, that may or may not hold true or that the margin is relatively narrow than lab results may suggest. Note that lithiums generally require a “smart charger” and don’t take very well to over-charging. Whereas lead acids tend to be very forgiving to “dirty currents” and over-charging situations. So depending on how “smart” that additional charging circuitry is inside the lithium, the true longevity of it may vary. Lithiums have significantly higher energy density as compared to their lead acid cousins. This means either very much LIGHTER if you compare 2 batteries at the same capacity, or very much HIGHER CAPACITY if you compare 2 batteries with the same weight – that’s their main advantage. The weight savings “advantage” is, to be quite frank, hardly an advantage to me. I may shave off a kg or two – and it would be very useful in a racing environment where every kilogram of weight shaved matter. But for my style of riding (commuting and touring), that 2kg of weight savings hardly amounts to any tangible benefits. I don’t race. And I don’t think I ever will. Not with my Pulsar 200NS anyway. And if I do, working on reducing my own body weight would likely yield greater benefits – both in terms of health and in terms of the amount of weight that could potentially be shaved. Next – energy density. That advantage will be very apparent if it were used in an electric vehicle. One could definitely use the weight savings and high energy density lithiums offer. You’d want to pack as much battery capacity as you can in the given weight and space limits so that the electric vehicle is useful for a longer distance. But for a situation where the battery’s primary use is merely to crank start the engine and nothing much else (the alternator / magneto takes over electrical supply when the engine is running), I think this advantage is moot. Lithiums also have higher cold cranking amps (CCA) as compared to an equivalent lead acid. So for starting the motorcycle in very cold weathers, lithiums have it easier. Obviously not an advantage I could use at all in this part of the world where temperatures hover around 30degC (86degF) all year round. So again, I don’t want to be paying for a feature I simply cannot use. The lithiums cost FOUR TIMES (4x) that of the lead acid battery. FOUR TIMES! If I could use the lead acid battery for, say, 3 years, would you trust the lithiums to do 12 years? From a technical point of view – both lead acids and lithiums suffer permanent damage from deep discharge events. So, if I decided to be silly and kill my battery again, it doesn’t matter if it were a 3-month old lead acid or a 3-month old lithium – either will die. But killing a lithium would most definitely hurt my pockets (a lot) more when it comes to a replacement. It’s like putting more eggs in the same basket with the lithium. And (accidentally) deep discharging it is akin to dropping that proverbial basket that carry more eggs. Of course, environmentalists will argue that lithiums are a lot more friendly to the environment. Lead acid batteries contain harmful acids that will damage the environment if not disposed properly. But saving Gaia isn’t quite the aim here, and also, probably unknown to many, Singapore has an excellent toxic waste management system with very clear disposal guidelines by the National Environment Agency (NEA). 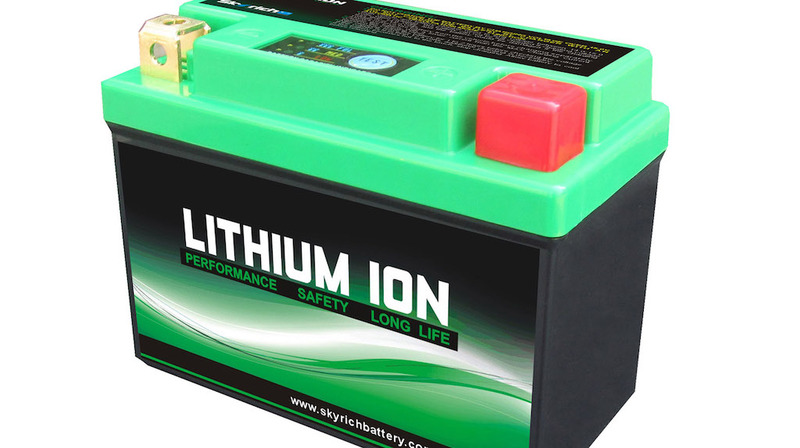 Lithium batteries have its place, but not as a motorcycle starter battery. So until the cost of lithium batteries plummets to levels close to that of the lead acid ones, or that legislation mandates the use of it, I’m probably staying with the good old lead acids for now. I could always use the money saved for other bike farkles. Just a recommendation. With the usage that you are doing for everyday and long tour hauls, it might be good to invest in a lithium batt but of course not the overrated brand as you mentioned. Personally i’ve got mine from the link mentioned below. Have use it for everyday use and multiple touring across the border and track circuits over a span of 2 years without any hiccups. I was skeptical at first though but manage to follow through after some research and taught myself to at least give it a try for personal knowledge. Do check it out with the guy selling it as he might be able to fill you in on the cost(Definitely lower than the ones sold at Bike Shop) and how it differs. Hope it assist your future trip endeavors. Keep up with the good work on the Adventure!!! I am in no way related to them by the way. Thanks for the recommendation. I’ve had a look at the link provided and contacted the seller. As I’ve suspected, these lithium-ion batteries are likely NOT compatible with my motorcycle. Also, these batteries are cheaper than the other retail ones as they are literally a bunch of lithium batteries soldered into a pack – no electronics at all. The retail ones come in a compatible housing (so that it’s same size as the lead acids) and many contain electronic circuits for charging, overheat and deep discharge protection. Also, like I’ve suspected, in real world motorcycle applications, the lithium batteries don’t seem to have such a long life as what the lab tests might suggest. In fact, his experience seem to also concur with my report on the incompatibility of lithium charging using primitive single-phase magneto-based electrical generation systems – as many “2B bikes” probably are equipped with. Me: Hi there! I am exploring the possibility of replacing my motorcycle’s battery with a lithium version and have a few questions. Was wondering if you could assist? What is the chemical composition of your lithium batteries? If installed on a motorcycle, is it a straightforward replacement? Are there any electronics on the battery? If so, what are they? Can my motorcycle’s charging circuit be used? What is the expected life of the lithium battery compared to lead acid? Thanks! Me: I ride a Pulsar 200ns. I think it’s the same battery as the Super4. How much is it? Me: What sort of problems? Battery died? Me: I c.. Thanks for your replies anyway! Now, I’m NOT suggesting that this guy’s a crook or the products he sells are bad in any way. In fact, FAR from it! I’m certain he’s doing an honest business and making an honest living, and I really appreciate his quick responses to my messages. In fact, if I’m looking for lithium batteries for use in some other applications, I might even look for him. But what I’m really trying to highlight is that lithiums just *may not* be the right or best tool for the job – in this case, as motorcycle starter batteries. Just gone through the second lithium. I would say that I nearly got 3 years between the two of them. Certainly not what I expected.